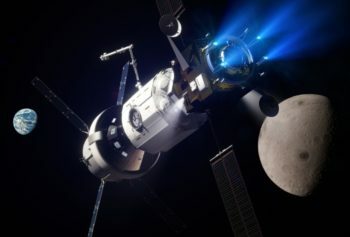 While NASA engages spacecraft industry help in studying concepts for design, development, test, and evaluation of the Power Propulsion Element (PPE), it is also studying where the anchor component of the proposed Deep Space Gateway (DSG) would orbit the Moon and how it would get there when launched as a part of Exploration Mission-2 (EM-2). 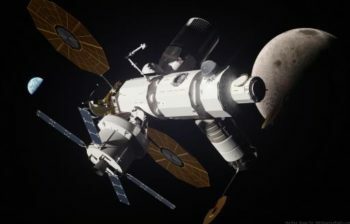 NASA recently awarded multiple contracts to industry to do a detailed study of the PPE that would be the first proposed piece of the Deep Space Gateway operating in cislunar space. A total amount of approximately $2.4 million was divided up in awards to Boeing, Lockheed Martin, Orbital ATK, Sierra Nevada Corporation, and Space Systems/Loral. In a presentation to the NASA Advisory Council (NAC) Human Exploration and Operations Committee on November 30, PPE Program Director Dr. Michele Gates from the Glenn Research Center in Cleveland noted that kickoff meetings between NASA and the awardees to officially start work coincided with the committee meeting, starting the last week of November and continuing into the first week of December. The kickoff meetings start the contract work for the 120-day study. Each of the awardees will provide an initial 45-day status briefing to NASA, which is planned for the January time-frame. That would be followed by draft study results at the 90-day point, and the final study results at 120 days. The awards were made after a new appendix was announced under the Next Space Technologies for Exploration Partnerships (NextSTEP-2) solicitation in July. NASA began NextSTEP in late 2014 within the Advanced Exploration Systems Division of Human Exploration and Operations Mission Directorate (HEOMD) to do research and development (R&D) work with industry on deep space technology capabilities that could subsequently be purchased in commercial partnerships as a part of future NASA human spaceflight programs. Appendix C, “Power and Propulsion Element Studies” was published in August with a set of high-level capabilities and requirements sought for the PPE. This coincided with an “Industry Day” on August 17, in which potential bidders were briefed on details of the upcoming study. A Request for Proposals (RFP) for studies was then posted at the end of August. NASA Glenn is the lead for the PPE and in responses to NASASpaceFlight.com questions, Dr. Gates and Dr. Mike Barrett, the PPE project manager explained the purposes of the 120-day study. 3) To obtain data that supports NASA’s ability to define, derive, and validate the PPE requirements and a baseline mission concept,” they wrote. “The output from the study will be briefings and reports that provide vendor results for the 23 study topics,” Dr. Gates and Dr. Barrett also noted. The current concept of the PPE, especially the use of Solar Electric Propulsion (SEP), was heavily derived from conceptual work and technology R&D done as a part of ARRM. The spacecraft for that since-cancelled mission was sized with a large, high-power SEP system. 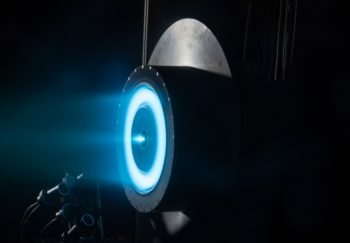 That electric propulsion R&D is continuing under the Space Technology Mission Directorate (STMD), with technology demonstrations also being led by the Glenn Research Center in Cleveland. Capabilities envisioned for the PPE include SEP for maneuvering and a hypergolic propulsion system for attitude control. Tanks for both the SEP system, which would use Xenon fuel, and the attitude control system would be refuelable. The PPE would include two International Docking System Standard (IDSS) docking ports at either end and would also handle power and communications for the gateway. The control mass for the PPE at launch on EM-2 is 7500 kilograms (kg), which would include the payload attachment hardware and a minimum of 1200 kg of Xenon in the 2000 kg class capacity tank. “The amount of xenon carried at launch is tradable,” Dr. Gates and Dr. Barrett noted in the email, as factors such as PPE spacecraft mass and Space Launch System (SLS) Block 1B vehicle performance are better understood closer to flight. The 23 study topics explore these areas and more, including integrating commercial spacecraft bus hardware with a SEP system, avionics and software integration, and rendezvous and docking of visiting vehicles. “These studies [are] very targeted at understanding in particular technical drivers and implications between previous concepts for utilization of this advanced SEP system in this Phase 1 of our Human Exploration Strategy,” Dr. Gates said in her presentation to the NAC HEO committee. 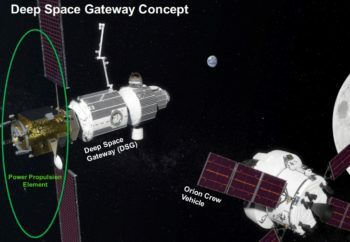 Introduced in March, 2017, the Deep Space Gateway concept envisions a human-tended vehicle that would serve as a staging point for exploration missions in cislunar space and beyond. Consisting of relatively few modules when compared to the football field sized International Space Station (ISS), the gateway concept announced would be the staging point for a larger, self-contained “Deep Space Transport” vehicle that would be capable of flying crewed missions to Mars and back. Another contrast with the ISS is that the DSG is not planned to support a permanent human presence. It is expected that the gateway will allow for an Orion total mission duration of 42 days, double its standalone capability of 21 days with a crew of four. At this point, the gateway is only a concept to be studied, not a new program or project. NASA has not officially proposed the mission in an annual U.S. federal government budget cycle and relative to other multi-billion dollar programs in NASA’s portfolio, only a small amount of money at this point is committed to conceptual studies such as these. The earliest that Deep Space Gateway proposal could be funded is at the beginning of Fiscal Year 2019 in October, 2018, assuming that there is language signed into law allowing a formal project start. This would not be the case if the U.S. government is funded through Continuing Resolutions, a situation that is now common throughout the fiscal year and is currently in effect for Fiscal Year 2018. Although the proposal is not yet funded, it was given a mandate by the new Congress and President in March with passage and enactment of the NASA Transition and Authorization Act of 2017, which emphasized deep space exploration as one of the goals for NASA’s human spaceflight programs, including the Orion spacecraft and SLS launch vehicle currently still in development. 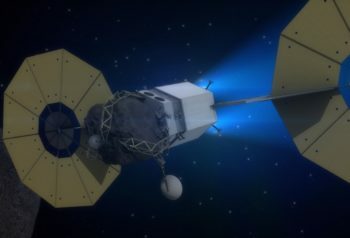 The ARRM asteroid redirect concept proposed by the Obama Administration as an initial mission for Orion and SLS was funded by Congress at low levels for several years and was effectively cancelled this year. HEOMD under Associate Administrator Bill Gerstenmaier, had already begun ramping up activities to study and better define alternate concepts and the Deep Space Gateway and Transport (DSG&T) concept was publicly introduced following enactment of the authorization as Public Law 115-10. As proposed, the gateway would be started by the PPE and the modules would be launched with Orion as co-manifested payloads on SLS launches. The PPE would be followed by a habitation module brought by Orion as co-manifested on EM-3. 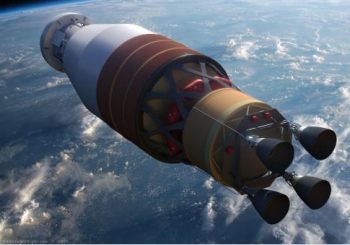 The proposal also includes an airlock module that would be launched with Orion on EM-5. 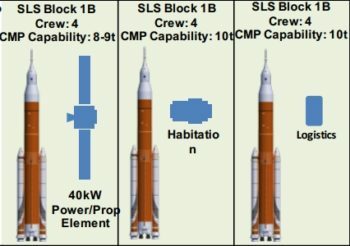 Logistics for the facility would use a combination of commercial launch services and co-manifested SLS payloads on other Orion missions. The concept has been evolving in talks that NASA is having with international space agencies that it is partnering with on the ISS. 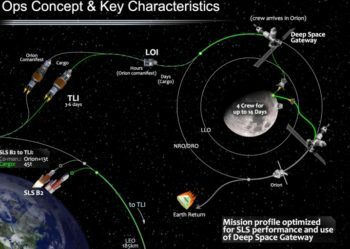 Although the Deep Space Transport is highlighted in the concept, the gateway could also be used as a “base camp” for lunar landing spacecraft or for other spacecraft that would operate in other cislunar orbits, such as at one of the Earth-Moon Lagrange points. 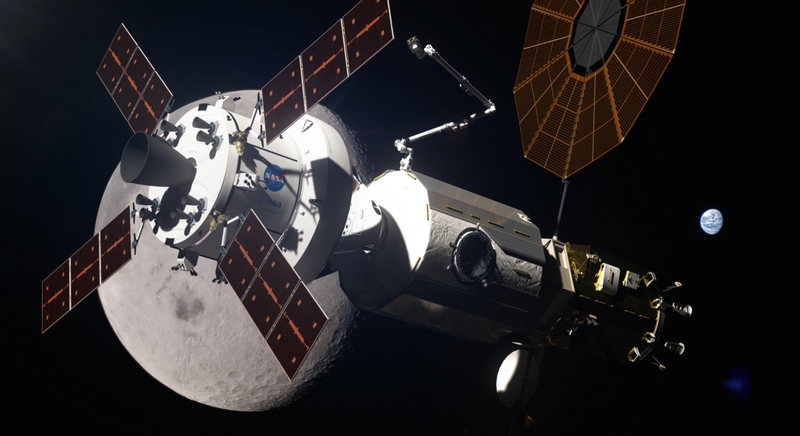 NASA has been evaluating operational concepts for missions to cislunar space since the asteroid redirect mission (ARM) concept was proposed. In contrast to ARM that favored a Distant Retrograde Orbit (DRO) around the Moon as a staging area (and which Orion will travel to on its EM-1 test flight), analysis of where the DSG might reside is leaning towards Near-Rectilinear Halo Orbits (NRHO). Both types of orbits are within Orion’s performance capabilities and both have relatively low demands on propellant for orbital maintenance, but the polar-oriented NRHOs have fewer eclipse periods than the equatorial DROs. Transfers from NRHOs to low-lunar orbit, such as a lander might use, would require less performance and take less time than from DROs. The PPE is planned to fly on EM-2, which will be the first crewed flight of the Orion spacecraft. 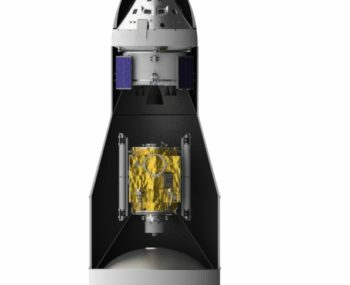 EM-2 is planned to launch using one of the first SLS Block 1B vehicles, and the PPE will fly as a “co-manifested” payload below Orion on top of the Exploration Upper Stage (EUS), encapsulated by the Universal Stage Adapter. The EUS will fly a more complicated insertion and deployment sequence for this first Orion mission with crew, which is for all intents and purposes a test flight. 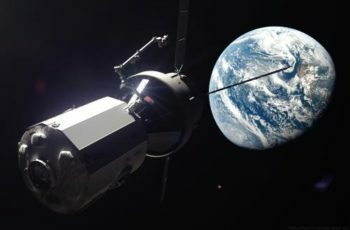 In order to mitigate some first-flight risks, Orion will stay in Earth orbit for nearly 24 hours before circumnavigating around the Moon. In the meantime, EUS will place the PPE on a translunar trajectory that will allow the PPE to insert itself in lunar orbit while also safely disposing of the EUS. The sequence is called Multi Translunar Injection (MTLI) Free and begins after the EUS finishes inserting the Orion / PPE / EUS stack in low Earth orbit during launch. After an initial orbit, the EUS will make its second burn to raise the apogee to a high-altitude with a period of approximately 24 hours. Orion will then separate from the PPE and EUS to remain in that high Earth orbit for an extended system checkout with its first crew. 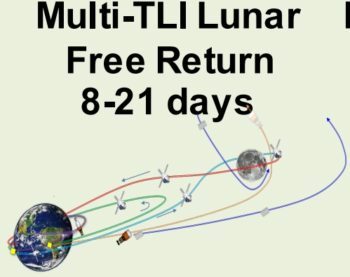 After a day in Earth orbit, Orion will perform its own TLI burn to put it on a “free return” trajectory that will make a single loop around the Moon and return to splashdown on Earth. Shortly after Orion separates from the EUS and PPE, the upper stage will make its final burn which will serve the dual purpose of a translunar injection burn and a disposal burn. While Orion stays in Earth orbit, the EUS takes the PPE with it to the Moon, placing both on a polar lunar flyby disposal trajectory. As the name implies, about six days later the vehicle flies over one of the lunar poles at an altitude of about 500 kilometers on a hyperbolic disposal trajectory out of the Earth-Moon system. Back on launch day shortly after this final EUS burn, the upper stage will deploy the PPE so that the spacecraft can independently maneuver to change its path to stay within cislunar space. 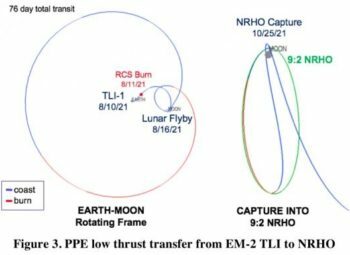 The paper provides a detailed look at one possible scenario for flying the PPE from the Earth to the Moon. The trajectory analyzed in the paper employs a 4.2 meter per second burn of the spacecraft RCS about 12 hours after the EUS TLI burn, placing the spacecraft on a trajectory to transfer to its intended destination halo orbit. The initial RCS burn using more traditional hypergolic engines allows for an extended checkout of the SEP system before it is used to insert the spacecraft into its destination orbit. After another 14 days and well after the spacecraft has made the first polar lunar flyby, SEP system would make an insertion burn that would last for about 22 days. As selected for analysis in the paper, the transfer would take about 76 days from launch on SLS to capture in NRHO. The halo orbit the paper used for analysis is a “L2 Southern 9:2 lunar synodic resonant NRHO,” where the highly elliptical orbit reaches its apolune over the Moon’s South Pole and the period of the orbit is such that there are nine orbits every two lunar months. “It is characterized by a perilune radius of about 3,233 km and an orbital period of 6.7 days,” the paper noted. In another paper prepared for presentation in an earlier AAS meeting, “Targeting Cislunar Near Rectilinear Halo Orbits for Human Space Exploration” notes that the 21-day standalone mission duration capability for Orion will constrain early missions to rendezvous with the PPE where the habitation module is not yet at the facility or fully operational: “We also became interested in “short stay” missions, where Orion would stay only 3-4 days in the NRHO (less than a full rev),” the authors wrote.